I think I wrote my car off yesterday. Thankfully I didn't write myself off, although that would have been difficult at the speed I was going. Nose down, the bonnet struck the bumper in front thus forcing back the radiator and resulting in a good old leak of both water and some oily substance. The other guy's car was barely scratched, but I did knock off the licence plate. I had to call the Assistance and get the recovery service in. The guy was happy to tell me my car was an 'épave', a wreck. I felt I'd made his day that he was able to go home satisfied that he'd dealt with a credible ruin. Recovery guys may not see life the same way as the rest of us. They were probably highly destructive little boys who spent much time in emergency departments and whose mothers cracked open a celebratory drink with each half decade they reached as a major achievement. 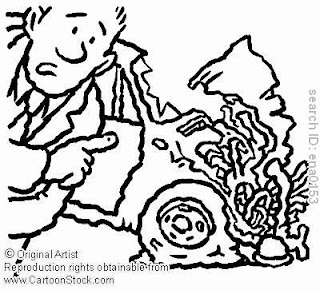 I empathised with my car, feeling pretty wrecked myself especially as it'll probably cost too much to repair and as an old car, I'd only insured it third party. Funnily enough, I had already been feeling highly broke, having just had my teeth done, and hoping fearfully that I wouldn't need a new car although the turbo has been playing silly buggers for some time. Famous last thoughts. I must have had a feeling that something was brewing. So what now? I'll wait for the estimate of repairs and then faint, then cry, and then a little hysterics might be in order, followed by taking to my bed with hard liquor. Yes, I'm kidding. I'll just throw myself under a bus. I'll probably have to face the fact that the car is dead and then look around for a replacement of some sort. Seeing as I have bikes to transport on a regular basis, there's no point buying a crappy old Twingo, but that's about all I can afford. Maybe my eldest could also go to school by bike! Oh dear, oh dear - but the only thing that comes to mind is chat I said to Maxime-Charles when he wrote his car off on the levés de la Loire - "are u all right? "...well that's chat really counts.. The rest is just bashed about metal, and however upsetting, the main thing is that u are fine...physically anyway. However after a big bash in the car, it does shake u up and down for some time. At least you can have a bit a fun finding a new car big enough for putting bikes into. So rude about Twingos!! We have one as our second/town car - it's bright pink with one purple door! Never lose it in a car park! ng: true that no one was hurt and while it might be fun looking for a replacement car, it won't be fun paying for it. Fingers crossed the garage can repair it on the cheap. DD: in a sea of white and grey uni-models, it sounds like it would stand out wonderfully!